Before man started cruising on the airwaves with radio, transistors and what not. Aerials were already in action in the vicinage of Nizamuddin, Delhi. A breed of four-legged superior intelligence was keeping the traffic well under control, and whiskers were never twitched harder, until the day when an intruder sends out ripples of shock waves. It was a sender and that too a loud one. There is only one rule to deal with such a potential threat. Spot it and kill it. 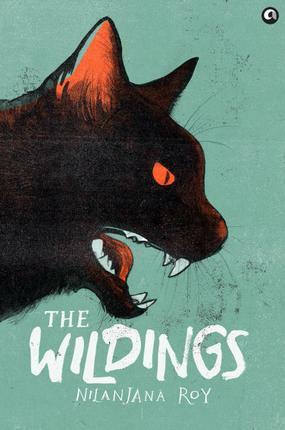 Nilanjana Roy’s debut novel ‘The Wildings’, have cats in it. Yeah, the ones who slip into your kitchen by maneuvering their elastic frame, making you sprint on the sound of a falling plate, those types. But there is something more to them that you are not aware of. Their communication process is not limited to meows only. It’s their whiskers that frequently saves them and links the whole clan through the airwaves. It’s a gift and a potent survival mechanism. Harmony prevails in the Wildings of Nizamuddin. Rats stay away from the traps laid out by cats and cats steer clear from Dogs. But the order of peace is tattered into pieces, when a voice is heard in many furry heads. A voice unmistakably distinct and strong, a voice of a sender. A meeting between the prominent members of the clan is convened on the Nizamuddin link, to find out who this mysterious sender is. Many important points are raised and a series of speculation is meowed. But the most pivotal question remains unanswered: ‘Why a sender appeared out of the blue, when there is nothing amiss and prey is in abundance? A sender is well suited in a tense atmosphere and it’s arrival under normal circumstances couldn’t be welcomed. Hence, the claws are sharpened and the message is relayed- Death to the sender. But, Beraal, the mighty cat queen who was determined to send the sender to her grave, gets the shock of her life when she finds out that her quarry is an orange colored kitten. This doesn’t shake her resolve a bit and she proceeds to finish her task. Her advances are met with friendly greetings and pleasantries from this monsoon green eyed kitten, Mara. Beraal is thoroughly confused by this bizarre behaviour. She is further dumbfounded to find Mara in a slumber, moments after she attacks her. The hostility, she bore in her heart for the dreaded sender evaporates in a jiffy, after she learns about the plight, suffered by this poor kitten. Mara was separated from her mother and forced to live with a family of big-feet. She didn’t mind staying here with them(who were kind and gentle to her), but her heart hankered for someone of her own tribe. Beraal sees much prospect in this kitten, who just needed an expert tutelage to mould her powers. Faced with a dissent from Hulo, a ferocious Tom cat, Beraal earns the right to Mara’s survival by defeating him in a duel. So, what’s so special about Mara? What striking quality of her’s, made Beraal turn against her old friend Hulo? Apparently, this kitten can do what others can’t. She can travel to far-flung places by connecting herself to the link. That’s how her virtual self lands up, right under the nose of a Royal Bengal Tiger ‘Ozymandias’. Before things could have gone out of hand, Rani(wife of Ozzy), steps in, to make Ozzy lay off the small kitten. Anyways, her travails earn her two precious friends, Rudra(The cub of Ozzy and Rani) and Tantara( A langur and the only playmate to Rudra in the zoo). The story gets more regaling in the presence of characters like Southpaw, a kitten whose favorite pastime is courting troubles. It’s his inquisitiveness that leads him and the other two elder members of the clan: Miao and Katar, to the forbidden territory of Shuttered House. The cats of Nizamuddin clan and cats residing in the adjacent areas, have sternly maintained their code of hospitality, over years. An honourable cat always holds his head high by setting an example and a dastardly act of killing for fun is always condemned by every feline. But goodness always comes under vicious attacks of evil. The law abiding cats of Nizamuddin will soon have their tryst with evil and mayhem will march out from the ramshackled confines of the Shuttered House. The catonification of Satan, Datura, will challenge the prevailing norms of the clans, by making an attempt to trample the serenity of the animal kingdom, under his claws of brutality and injustice. What would be the outcome of this battle? Would it be a complete annihilation of the cat colony by Datura and his huge army? Or would it be a victory of the noble ones? and last but not the least- Whose side the sender would take and how her involvement would change the course of this war? To find out the answers, pick your copy of ‘The Wildings’ today. Nilanjana Roy earns her stripes with her very first novel ‘The Wildings’. Her unfettered imagination snuggles comfortably with her pen. She effortlessly establishes a rapport with the reader in the first few pages and keeps them rooted to the plot. Her characters display every other trait, found in humans. Beraal, Katar and Miao paint the soothing shades of compassion and kindness that gives a tough resistance to Datura’s grotesque blackness of cruelty. On the other hand, the Seven Sisters form a perfect image of frivolity and cheerfulness by being the untouchables, who were never touched by malice and ill will. Roy sprinkles humour frequently on the story and makes ‘The Wildings’, an ultimate delectable for cat lovers. Her tongue in cheek description of cat lawyers; practicing in the supreme court, exhibits her dexterity in extracting laughter out of a solemn profession, without violating any statute.